Content is more important than form – and you should never judge a book by its’ cover – but the new edition of Comrades in Conscience brings the physical quality of the volume more on a par with the standard of its contents. In a larger format, with bigger print, it is much more reader friendly than the old edition, with its tightly packed text and wide margins which made it look and feel a little like a manual. The illustrations also benefit from the clearer presentation and have been added to, creating a book which is both aesthetically pleasing and historically valuable. Amazingly the retail price of £15 remains the same as the original edition. When this book first appeared in 2001 it was the first detailed, in-depth study of Conscientious Objectors in a local community. As such, it presented an excellent model for similar studies of other communities. Despite some research at a local level, thirteen years on, there is still nothing to match Comrades…. either in narrative scope or level of analysis. Whether this is, in part, due to the highly partisan nature of the subject matter, or the priorities of modern historiography is outside the limits of this review. Even on the left the approach to Conscientious Objectors has been sectionalist, if not sectarian, dealing only with those who had a political motivation, or dismissing them altogether as pacifists detached from the class struggle. What is clear is that Cyril Pearce’s unarguable insight derives to a great extent from the fact that his own intellectual and political ideas are deeply rooted in the community he writes about. This has been reinforced by direct contact with local COs themselves and their immediate circle, a source no longer available. Consequently Cyril Pearce’s approach to the subject has an intimacy and commitment denied to most of those from an academic or activist background. In short, the local Socialist and radical culture which created the COs also created their historian – and Cyril Pearce has risen to the task. This insight, and the consequent additions to the new edition of Comrades…. , has been enriched by his further research on COs in Britain as a whole. This has enabled Cyril to put Huddersfield in a wider context and provide a new perspective on how far the phenomenon of CO resistance, so apparent in the town, was replicated elsewhere. The new edition of Comrades…. provides both a reconsideration of the CO community in Huddersfield and a tantalizing preview of his forthcoming book on ‘Communities of Resistance’ throughout the country. Even before the appearance of his new work, in an act of intellectual generosity and democracy, Cyril Pearce has offered his findings – biographical details of almost 17,000 COs – online, to the public, as the Pearce Register of British Conscientious Objectors. Its’ publication only awaits implementation by the Imperial War Museum. Hopefully this will inspire and enable people, using Comrades … as a template, to place COs in the history of their own localities and, in so doing, help us to answer some of the questions posed by the book. One of the main strengths of Comrades…. is that it provides not only a picture of people, organisations and ideas which made up the local Community of Resistance, but that it places them in the wider social and political milieu of the town. 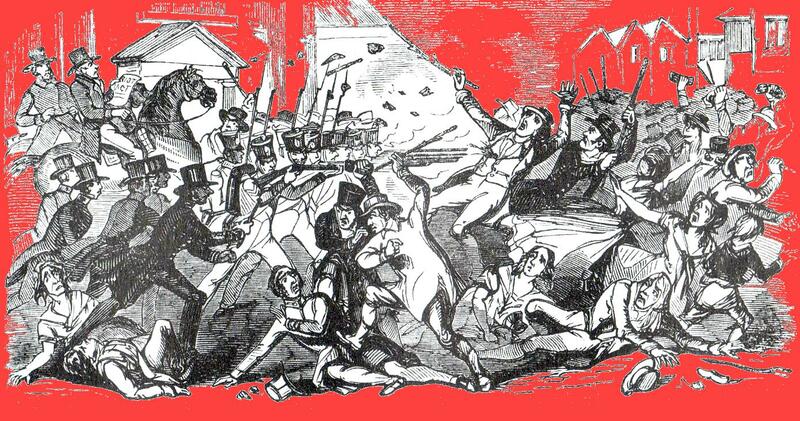 The account of Huddersfield on the eve of war and in the run up to conscription provides both the context for the central topic and also a very useful contribution to the history of the local labour movement and borough politics. The complexities and practicalities of the Military Service Act and the tribunal system are clearly described and illustrated by local cases. Although there is a wealth of legal and statistical detail the drama and absurdity of the process is not lost sight of, the case of Arthur Gardiner particularly enlivening the account. Cyril also lets Gardiner and other COs speak for themselves by including contemporary reports in the appendices. His painstaking research since the completion of the first edition has allowed him to arrive at a more confident and yet nuanced assessment of the numbers and nature of COs in the town. The new edition identifies 117 men from within the borough who resisted their own conscription to varying degrees. However, Cyril emphasises that this does not embrace all who held anti-war opinions – including some who, for whatever reason, actually reported to the colours – let alone the wider ‘Rebel Society’ which provided the support network for the COs.
No one is more aware than Cyril himself that the Borough boundary is an arbitrary delineation of a ‘community’, particularly of the anti-war movement which derived much support from outside the town. Indeed, one feels that it is with some reluctance that Cyril has culled some COs from his local list. However, the book retains a brief yet poignant acknowledgment of the role of Huddersfield’s hinterland in the account of a peace meeting at New Mill, known before the war as the ILP’s ‘Red Village’. 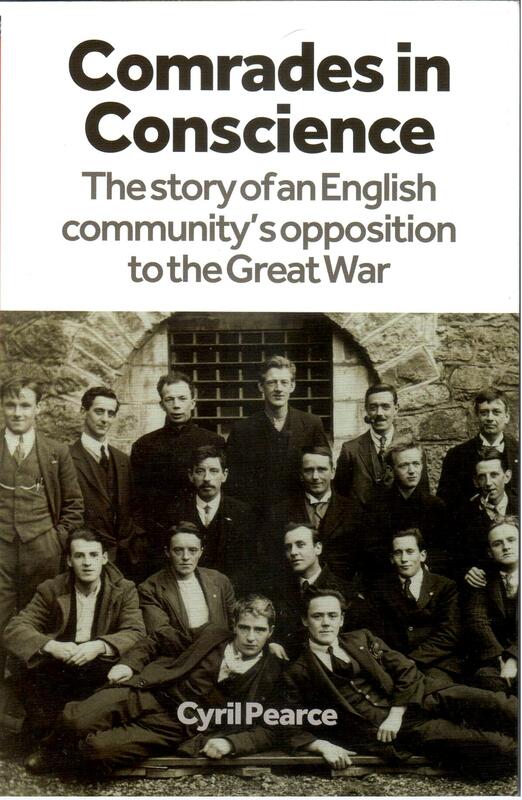 A new appendix tabulating the 117 Huddersfield COs includes more biographical detail than the first edition and provides a rich vein for both students of the war and family historians. It reveals what a potential goldmine awaits us in the Pearce Register ! Cyril Pearce has done a tremendous job in rescuing COs not only from the condescension, but also the hostility and derision of posterity. Comrades…. and the Pearce Register indisputably show how widespread opposition was to the war, while remaining a minority opinion. The lights may have gone out all over Europe, but each CO was a small beacon in a sea of darkness and insanity. By putting on record the lives of those who opposed the war and militarism, Cyril Pearce is reminding us that acts of individual conscience and will are essential to collective resistance. This is certainly not a book that can be pigeon-holed as ‘local history’. Comrades…. (and the wider project of which it has become the progenitor), is of much wider historical significance, particularly in this centenary year. More importantly, as the hydra of militarism continues to wreck the lives of millions across the globe, it is a work of immediate political relevance. Cyril Pearce achieves this by a well documented account and ingenuous analysis, devoid of any hint of polemic or moral didactics. Hopefully it will be read not just by historians, but by peace activists, politicians, journalists and all concerned with making ‘No More War’ a reality. Yorkshire Post Review of NEW Edition of Comrades in Conscience – plus video. International Conscientious Objectors’ Day 15 May 2014. A review of the original book may be found on the webpage ‘The White Feather’. 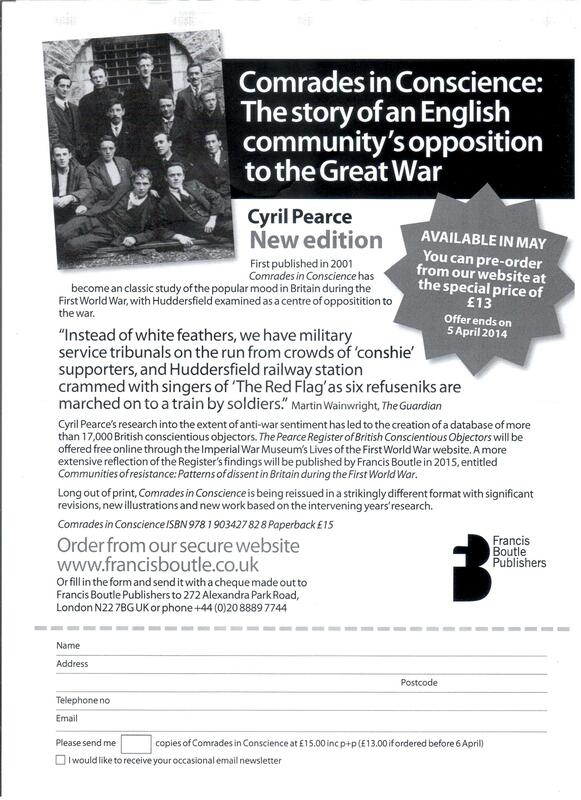 This book is a must for anyone interested in opposition to the Great War and/or Huddersfield’s Radical history. Here is an order form for the pre-publication special offer. LONDON LAUNCH and C.O. COMMEMORATION. Tavistock Square, London WC1, on 15 May. with Friends’ Ambulance and War Victim Relief services. some of the families afterwards. Contact Pat Gaffney, details below. Ambulance Unit and was killed in Picardy when a shell hit the ambulance. War medals and the 1914-15 Star. Warrington and Wormwood Scrubs prisons. caught and sent to Dartmoor. the upper classes to preserve their privileges or defend their empires. civic leader and Lord Mayor of Neath. James Ashworth, was a mill worker who supervised other slipper makers. near Clitheroe in the Ribble valley. War and became Prime Minister in 1945.
death sentence – which was commuted to ten years’ penal servitude. of her CO grandfather, a Quaker teacher in the Middle East. First World War conscientious objector. sing two peace songs during the ceremony. convictions, and often by a combination of these beliefs. League for Peace and Freedom. artefacts and diaries belonging to imprisoned COs.
objectors will take place in Friends House Library. by David Boulton (Quaker History Society).